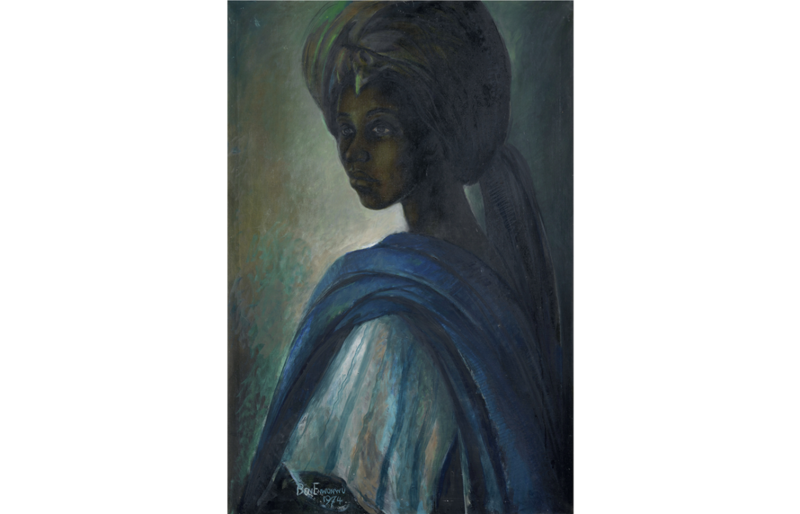 Celebrated Nigerian artist Ben Enwonwu MBE headlines Bonhams February 2018 Africa Now sales, with his oil painting, Tutu, 1974, 97 x 66.5cm, estimated at £200,000 –300,000. This now world-famous portrait of Adetutu Ademiluyi, an Ile-Ife princess and a granddaughter of the Ooni of Ife was first painted in 1973. Other lots in the auction include Yusuf Grillo’s Evangelists: Cymbal, Triangle and Tambourine, 1964, oil on board, 121 x 78cm with presale estimates of £50,000 –70,000; Cheri Samba’s La Democratie?1995, oil on canvas, 83.5 x 103.5cm, estimated at £18,000 –22,000; Aboudia Abdoulaye Diarrassouba’s Untitled, 2013, mixed media on canvas, 200 x 398cm, with presale estimates of £10,000 –15,000; Goncalo Mabunda’s A Throne for Two Kings, decommissioned weapon parts and welded metal, 138 x 63 x 114cm, estimated at £10,000 –15,000; and Uzo Egonu’s Stateless People: An Artist With Beret, 1981, oil on canvas, 153 x 124cm, estimated at £10,000 –15,000.